Search Engine Optimization gurus — the people that get your site to come up on the top of Google results — are saying that how quickly your web pages display is an increasingly important factor in determing where you show up in the list of relevant sites that Google returns to your potential customers. If your site is slow, Google will drop it down low on the results because Google thinks that its users are impatient. So, if you have useful information that takes 10 seconds to display to a visitor, your site may be down the list of competing sites with inferior data if they show up in less than a second. Google’s focus on speed impacts your choice of the technical platform of your site, its hosting service, and additional support. Use simple HTML for your pages instead of pages built with scripts such as those used by WordPress. Purchase third-party services designed to improve the availablity of your site throughout the Internet. Sign-up for a beefy hosting plan that is designed to serve up WordPress pages. Third-party services that cache the site and deliver the pages from different servers around the contry/world by can greatly improve the responsiveness of static, HTML site. We use one called Cloudflare. San Francisco Internet Marketing and Web Design site. But, Cloudflare cannot improve the speed of dynamic sites so dramatically. If you have a site built on WordPress where some of the page content is created each time a visitor clicks to see it, Cloudflare won’t help. And, even WordPress pages without content that is obviously changing come back more slowly than sites using only HTML. This blog served by Cloudflare. Pages on these WordPress sites — even sites using Cloudflare — take longer to show up on your screen than the HTML sites. WordPress offers a lot of advantages for business owners and their designers. But, WordPress comes with a handicap. It’ll be slower unless you spend extra money on hosting and also use care in turning on add-on functionality that require CPU cycles to produce a page. Let’s talk about your need to be high in Google rankings, your need to do updates to pages yourself, and your budget for hosting services! Updating of its modules to plug security holes that have been discovered. Monitoring of visitor comments. You’ll want to respond to questions or complaints, and you will want to encourage people’s comments. Watching for fake spam comments that are loaded with links to scammy sites. Fortunately, regular maintenance is neither difficult nor time consuming. 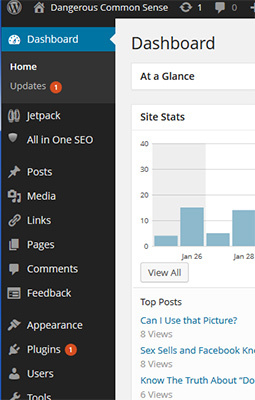 Review the WordPress Dashboard. Any pressing tasks will be highlighted in red and also the number of tasks will be shown on the header line at the top. In the example at right, there is 1 Plug-In Update pending. If there were comments needing review or theme updates waiting, there would be a red number by those menu items. Click on the lines with red numbers showing, and follow the instructions. This process will bring your site up to the latest version of its software. Click on the “Comments” menu item and see the new comments have been posted site-wide. Click on ones you want to respond to. If your site allows any comments, install the Akismet plug-in to block spam comments automatically. The service is free for personal sites and $5/month for commercial sites. Set up an unattended backup so that you will have access to a copy of your live system in case something unexpected happens to your hosting service or software. We use Updraft for the sites we create. The full-featured version allows us to stage a site, show it to a client, and then migrate it to the client’s live URL. For your website, if you don’t need any special functionality, you maybe able to use Updraft’s free version. Or, buy your own license for $60/year. You, or your web developer, can install the backup program when your site goes live. Establish a regular schedule for the backups and test the procedures. Because WordPress sites are dynamic and can be updated from different locations, your maintenance activity is critical, if not terribly time consuming. Besides, although this post is written saying that YOU, the website owner, have maintenance tasks waiting for you with a WordPress site, you can delegate your responsibility. Ozdachs will do regular or ad hoc maintenance on your WordPress site. Or, you can assign the routine work to a techy in your organization. Want more information? Leave your questions here, or call us at 415.347.6479 for a private response. It used to be that clients asked a developer to create a website, the site went live,and then the owner let the site attract business for them without any further effort. The owner usually didn’t update the site regularly, and there were no maintenance tasks to be performed. Maybe some content would be updated every month or so, but maybe not. Now, though, business owners have jumped on the DIY updates/blog wagon. They want to be able to create their own posts, and they want to be able to change the photos and content on the their websites themselves. In response to this new approach, WordPress has exploded. WordPress lets you create and modify a website from a web browser anywhere in the world. The pages of the site are created by a script that runs when a visitor wants to see that page. Unless you buy a more powerful, expensive hosting service, the pages may take seconds to appear on your visitor’s screen. Significant slowness will make your site fall in Google rankings. WordPress sites are complex merges of scripts from many different programmers. A WordPress template typically contains great functionality and flexibility. However, making a fine-tuning change that is simple using HTML may be very, very, very difficult to accomplish in WordPress site. If the WordPress developers or authors of the template you use did not expect you to want to modify a color, font size, margin, or other specific detail, then making that modification can be hugely difficult. Since WordPress sites can be modified from anywhere in the world. the latest version must be consciously backed up. With an HTML site, the master site is developed on a local PC and then a copy is uploaded to the web hosting service. The live version visitors see is backed up by static code on the developers computer. On the other hand, the live WordPress site is a dynamic master site whose code and database settings must be intentionally saved. Since WordPress sites can be modified from anywhere in the world, evil hackers are always trying to break into your site and do malicious things with it. The WordPress developers and the authors of the software plug-ins you use on your site regularly issue updates that both address security issues and add functionality. The website owner must regularly check for updates to the site’s template and plug-ins and install them. The owner should regularly check for comments and questions and respond. The owner will need to moderate the comments. Spammers will make bogus comments with links to their own scammy site, trying to lure other visitors to their den of inequity. Check out our next post on the tools we use to stay on top of dynamic WordPress sites. We’ve Moved from Bluehost. If You Use WordPress, You Should Move, Too. Going to this blog’s home page resulted in at least 10 seconds of wait time until yesterday. That’s the day we moved it from Bluehost hosting service to One World Hosting. We recommend that anyone — make that everyone — who uses WordPress blogging software for their site move ASAP from Bluehost. They are just too damn slow! WordPress blogs and sites take more CPU power to deliver than simple HTML-based sites. Every time someone asks for a page, WordPress rebuilds the page you see with a script. There is some remembering (caching) of recently delivered pages, but, basically, the hosting servers have to do more work for a WordPress site than they do for a vanilla HTML site. But, Bluehost compounds the need for CPU resources by penalizing sites that need more computer power by denying them even average access to the CPU. Bluehost has server software that “throttles” sites that use more power than an arbitrary amount of CPU time Bluehost has decided is reasonable. This means that your visitors have to wait extra seconds for your WordPress-created pages to be shown to them because your site is consciously denied CPU time by Bluehost. Bluehost says they “throttle” sites that use too much CPU power so that other sites on the same shared server do not suffer. The concept is fair in theory. Someone could code scripts that run in a loop or otherwise hog the computer. But, Bluehost is catching vanilla WordPress sites in its resource rationing. This blog — and another client blog I hosted at Bluehost — use standard WordPress themes and plug-ins. There’s no custom code or exotic functionality that requires an abnormal or unfair amount of computer power. They shouldn’t be penalized for using too much of the computer. When I wrote Bluehost support about the site’s slowness, they explained their company’s throttling was automatic and said that debugging my WordPress site to discover which plug-in or function was causing the excessive resource demand was beyond their free service to clients. They sent me links so I could buy consulting services to discover why and where I was using more CPU time than Bluehost thought I should. Casual WordPress users, using pretty standard functionality, should not have to analyze — or pay to have someone else analyze — their use of a hosting service’s resources. Thus far I have moved WordPress sites to One World Hosting and Webmasters.com. The speed of the copies on these two hosting services was much, much better than it was on Bluehost. Since site speed affects Google’s ranking of your pages, WordPress sites really need to migrate away from Bluehost and its throttling.